Here is what you’ve heard about the Divine Comedy: the Inferno, with its poignantly vivid tortures and its cacophony of wicked voices, is the most entertaining canticle, beloved of various and sundry; the Purgatorio, with its wistful focus on the lives and ambitions of poets and its chastened mundanity, is of special interest to writers and artists; and the Paradiso, with its saints in chorus, its mystical refusals of imagery, and its long disquisitions on Scholastic philosophy, can be appreciated exclusively by the faithful, and even they might nod off. Being a contrarian by nature and a producer of “fresh content” by mission, I am supposed to tell you that everything you know is wrong. I will, eventually, but for now let’s give the devil his due: Dante’s Beatrice-guided tour of Paradise is depressingly devoid of drama. At one point when Dante seems to feel fear, Beatrice rebukes him and reminds him that nothing bad can happen in Heaven. What can happen in Heaven? Dante can have the secrets of the universe revealed to him. Beatrice and a host of sometimes literal luminaries (St. Thomas Aquinas, the emperor Justinian, Charles Martel, St. Peter Damian, St. Bernard, and more) explain to Dante the nature and purpose of God’s creation, from the dark spots on the moon to questions of salvation. Dante doesn’t even have to ask, because everyone in Paradise can read his mind. The Paradiso, therefore, very often reads like a beautiful digest of medieval thought rather than much of a narrative or drama—interesting on historical grounds, but a good deal less exciting than even Dante’s earlier rivals in epic poetry, Homer or Virgil. As for Beatrice, I admire Dante’s Troubadour audacity in elevating his school crush to a level of holy authority just below the Blessed Mother, but Bea must be second only to Milton’s God in the annals of Christian poets’ divine disappointments. Unlike the solicitous and even maternal Virgil of the previous canticles, Beatrice lords it over Dante like a stern schoolmistress or martinette. She rarely—at least in translation—speaks a word in tenderness or spontaneity; comparing herself to Jupiter when he accidentally annihilated his mistress, she notes, “‘Were I to smile, then you would be / like Semele when she was turned to ashes'” (note the gender swap—Dante=Semele, Beatrice=Jupiter—more of which below). She sometimes seems like a machine programmed with the thought of Aristotle and Aquinas—as, to be fair, do the rest of the saints in Heaven. At times in reading the Paradiso, the incorrigible post-Christian reader feels a nostalgia for the agitations of hell. For the purposes of this piece, I am going to omit discussion of the Paradiso‘s philosophical particulars—if you would like to know why there are hierarchies among the angels or whether or not there are degrees of divine dessert among unbaptized infants, the answers are there in the poem, even if I have not managed to hold them all in my mind or understand all their logics (“‘he who hears, / but does not hold what he has heard, learns nothing,” chides Beatrice—o mea culpa, bella donna!). Instead I will seek elements of literary (as opposed to philosophical) and human (as opposed to divine) interest. It is also, like the trilogy of which it forms the final part, a poem of boundaries: Paradise, like Hell and Purgatory, is carefully ranked according to the merit of each of its constituent elements. God does not permeate the universe equally, and where His light shines lowest, matter is freest to take its errant course, hence the presence of those who have failed in some way even in the lowest layers of the heavens. O you who are within your little bark. that shoreline where Europa was sweet burden. the sound plums into rotten, empty skins. His final guide, the mystic St. Bernard, introduces the personae of Paradise as “great patricians / of this most just and merciful empire.” Spiritual and secular authority, which Dante had taken pains to separate, here collapse back into each other so that Paradise is an ideally ordered empire. Dante seems to be at the verge of the post-Christian world, very nearly imagining, like Hegel or Marx, that God might be nothing other than the imagination’s projection of good governance onto the heavens. Though Dante was thus (to use an anachronistic term) a totalitarian, he was no phallocrat. Writing in the mariolatrous Middle Age—St. 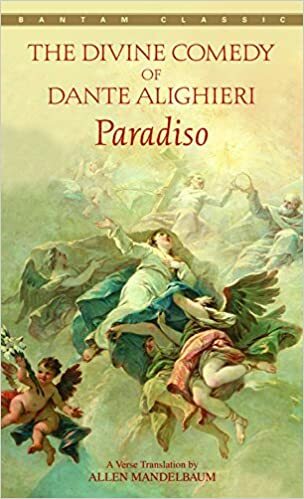 Bernard, reports one of Allen Mandelbaum’s endnotes, did much to revive the cult of Mary—and nearly deifying his first love, Dante places an ideal image of woman at the center of his vision and pictures Paradise as centered upon a rose, not a phallic but a vulvic image. No wonder the Apollonian male poet allows himself to be figured by his beloved as Semele, mother of Dionysus. God is the artwork that holds the totality of experience, including every opposition (male/female, spiritual/temporal, good/evil) in perfect balance and tension. God is the total book, the highest epic—or, as an incorrigible post-Christian like myself might insist, the supreme fiction. God is the Divine Comedy. my heart the sweetness that was born of it. Dante, the poet attempting to record his vision, is like a man awakening from a dream he does not remember, filled with the emotion of a dream, but with no clear recollection of its particulars. We are reminded of Coleridge’s preface to “Kubla Khan,” where the poem itself is presented as the recollection of a dream. Reading this last canto, it is easy to see how the Romantic poets were attracted by Dante. The stupendous tension of the remainder of the poem derives in large part from Dante’s dramatization of his present struggle to recollect (i.e., imagine) and describe (i.e., create in words) the content of his final vision. Not just a static affirmation then, but one in motion. God seeks “new loves”—should this not be foreclosed by Beatrice’s logic when she claims God seeks no “new goodness”?—and so blossoms as the rose does. Again, we suspect that Dante can’t do it: he cannot separate divinity from nature, nature from art, though Aristotle or Aquinas tell him he must. God is a rose is an artist. When I first read Divine Comedy, I was actually pretty fond of Paradiso, I thought it’s celestial imagery fascinating, the intricate riches of its symbolism and depth endless to exploration and thought, and I didn’t really find it boring (though, after having reread the Inferno, it would seem less dramatic or even passionate).